This interior designer transformed his parents' backyard and the results are gorgeous. As an interior designer, Orlando Soria knew he wanted to transform his parents’ new home into something completely unique to their tastes. Soria’s parents, Catherine Soria, a retired teacher, and Dale Soria, a retired dentist, celebrated their long careers by purchasing a new home in Santa Rosa, California. The home featured an aging deck leading to the backyard, and that's where Soria saw an opportunity to turn it into an outdoor oasis that his parents could enjoy for years to come. Soria renovated his parents’ kitchen along with the deck — a huge project that he began in July 2017 and completed in July 2018 — however, he says the deck took only about a month of work. 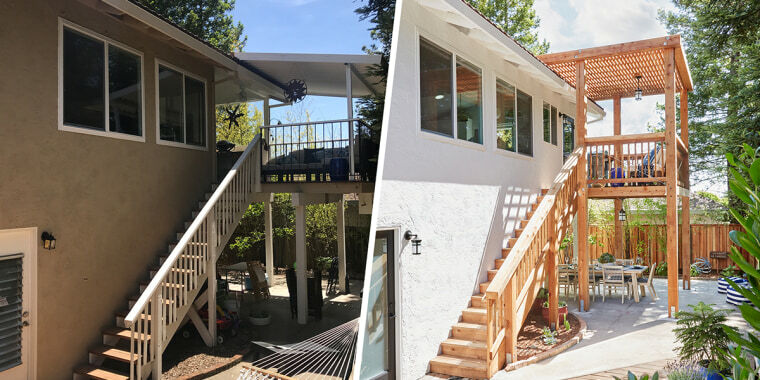 In addition to the modern deck, Soria painted the back of the house white — and the difference is stunning. The contrast of the redwood against the white backdrop makes the space look more cohesive than it did before.